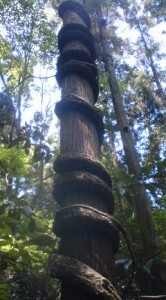 From my old house in Konda, Tsukuba, I had a clear view of the Woods. I spend some time each day gazing out over these last remaining wilds of Tsukuba, trying to savor their beauty as often as I could before the bulldozers showed up and cleared them all away. From my window I used to able to observe how , what were at first small patches of light violet, would almost completely take over the thickly foliated forest canopy, which seemed to be enshrouded in a purple haze. This morning, having some time to spare, I took a 3 hour hike in the some of the last remaining Konda woods, those on the site of the ruins of the old Konda Castle ,and most of the time, whether I looked up towards the sky or down on the ground, it was this the same color- FUJI COLOR (fuji-iro ), the color of wisteria, that I saw. The winding vines of these endigenous plants creep up trees as high as they have to go for their flowers to get sufficient sunshine (suffocating many trees in the process), while the petals of these flowers which form in bunches, not unlike those of grapes, are rustled in the wind, and scattered onto the forest floor. 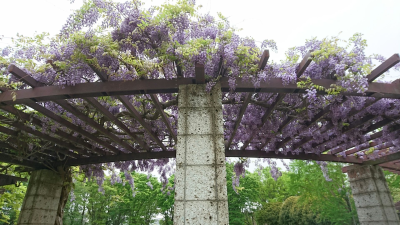 With spring`s loud and constant call-and-response chorus of birds and the sweet, syrupy smell of the wisteria (藤, fuji) flowers themselves, I all but forget about the modern world (though in fact I am within easy walking distance of Tsukuba Center and the TX train terminal). If you have not yet noticed the FUJI high up in the trees, from late April through May you might have run into some growing on the specially designed wisteria racks (fuji-dana) which can be found in many of Tsukuba`s (and the rest of Japan`s) parks. 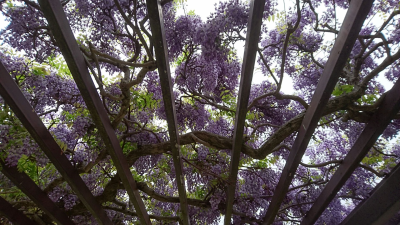 These fragrant and very elegant flowers have long been a beloved symbol of late spring in Japan, and are deeply connected with classical Japanese culture. 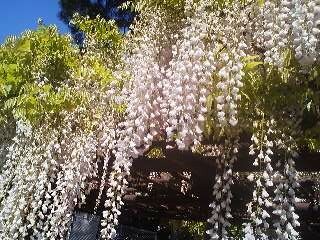 In fact, they are the first flowers ever mentioned in Japanese literature. One chapter of the Kojiki (712), the official collection of founding myths commissioned by the ancient Japanese Court, tells the story of the very desirable daughter of the Deities of Izushi. There were two brothers, also sons of deities, and the older brother, after having failed to win the affections of the fair Goddess, challenged his own brother to a contest at winning her hand. This older sibling said that if his brother were successful in this venture he would present him with gifts clothes, wine and other delicacies. The younger brother went and told his mother about this offer (I guess they had different mothers! 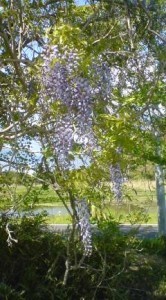 ), and the mother, in an effort to help her son, made for him footwear and clothes, as well as a bow and arrow, all from wisteria vines. When the young deity arrived at Izushi-Otome-no Kami`s (the girl`s) home, all these bloomed into wisteria blossoms, and the girl(goddess), bedazzled by these strangely beautiful flowers, took him as her lover! In the Manyoshu, the earliest (and some think the greatest) collection of Japanese poems (compiled around 759 AD), there are 27 poems which mention FUJI (the flower, not the mountain). 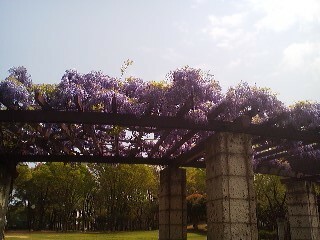 Here is an example which uses the image of the wisteria bunches rustling in the wind, like waves (fuji nami, 藤波）: 藤波の花は盛りになりけり平城の京を思ほすや君（FUJINAMI NO HANA WA SAKARI NI NARIKERI NARA NO MIYAKO O OMOSUYA KIMI) which I very roughly translate as- When the fuji clusters in full bloom blow in the wind like waves- I remmember Nara, the capital, and YOU who remain there. 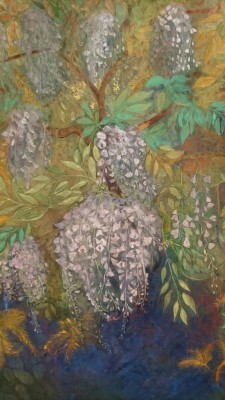 In the Heian Period (794-1185) the Golden Age of classical Japanese culture, the wisteria, and its color (fuji-iro or FUJI COLOR), was very highly regarded for its beauty and elegance. This might sound ridicuolous, but several Japanese sources tell me that there is also a connection to the fact that this period`s most powerful family was the Fujiwara (藤原）, with the characters used for writing this name meaning WISERIA FIELD ( I still cant figure out if this means that the family took on this name because of the flower`s prestige or the flower grew in prestige because this great family was called the Fujiwara!). 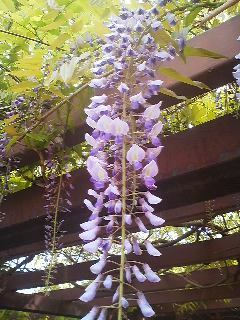 No matter which is true, purple and all its shades came to be a symbol of the aristocracy and elegance (Sei Shonagon even writes about this in THE PILLOW BOOK- Makura No Soshi).It is interesting to note however that the FUJI COLOR so important as a dye at that time was not created with wisteria, but with a combination of indigo and beni blossom dyes. 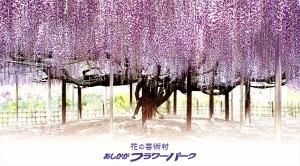 The color achieved, though, was like that of wisteria and was considered the color of colors (iro no naka no iro)by the Heian Elite. In the Edo Period it was popular for the wealthy to send a gift of Japanese sweets in the shape of things which began with the syllable FU. This is becaue the word for lucky FUKU, begins with the same sound. 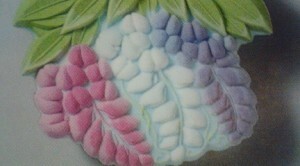 Thus, famous sweet makers such as TORA-YA created pretty little snacks in the shape of FUJI (wisteria), Mt. Fuji, Futamata Daikon (two-pronged radishes) etc, and packed them in boxes shaped like ship (FUNE, also beginning with FU). 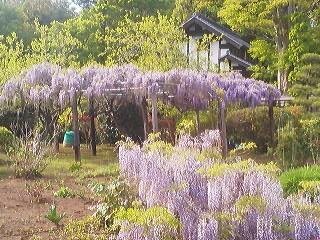 I have even heard that some people, especially in Nagano Prefecture, eat the young wisteria blossoms after making them into tempura! 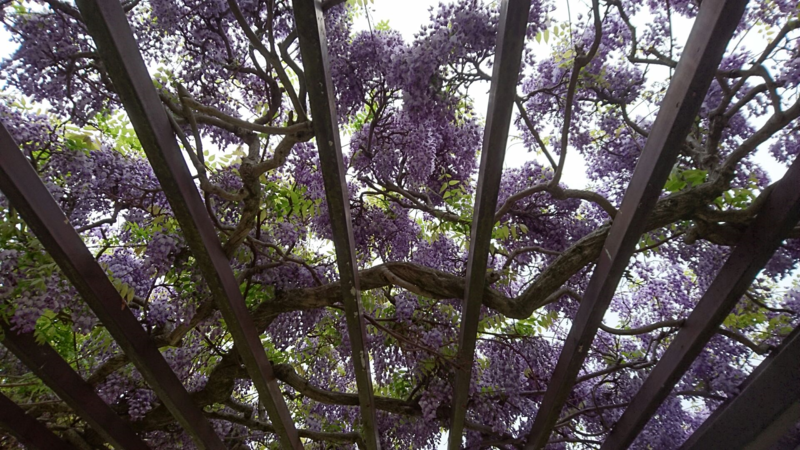 Even if this does not sound appetizing to you, one thing you will notice, if you stop to enjoy some wisteria in the park, is that BEES seem to find them delicious. 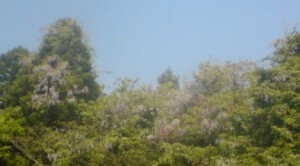 There always seem to be plenty of buzzing about FUJI, especially that of the big, fat carpenter bees (kuma bachi). And remember, this week if you are walking absent-mindedly down the road and a sweet smell hits your nose, look around and especially up overhead- you are very likely to find the purple haze of FUJI nearby.